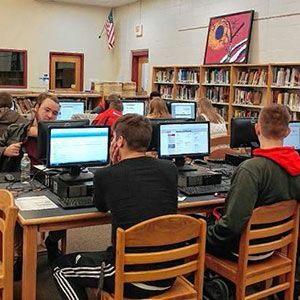 Students are scattered throughout the rural high school’s small library, typing away on laptops. It is Giving Tuesday, but they are not making charitable donations, they are applying to college. An equal number of adults fill the room, checking in with applicants as they write essays, fill out academic information and list extracurricular involvement. “This is easier than I thought,” one student admits as she clicks from one screen to the next. With other volunteers from high schools and universities, I am here to encourage students to take the final step and submit at least one application for college admission. I am inspired by the dedicated educators engaging thoughtfully with young people, who without an invested adult might slip through the cracks or choose the path of least resistance. My reflection is interrupted by a joyful cheer and a high-five from across the room. The senior is beaming with pride as he submits his first application. “I am college bound!” he exclaims, repeating the campaign’s slogan. Applying to college can be a daunting thought for even the most resilient teenager. On one hand, students hear about the hyper-selectivity of college admission. On the other, they are overwhelmed by the prospect of paying for higher education in a state that ranks last in funding for higher education and highest in student loan debt. Too many students self-select out of aspiring to earn a college degree. With an aging population in New Hampshire, it is no surprise that we are confronted with a workforce development challenge. During the last three weeks of November any student can participate in these day-long programs at their high school and receive individualized assistance from higher education professionals, along with fee waivers towards applications to colleges and universities throughout the state. Over the course of the day, I helped some students complete applications to two-year degree programs in fire science and advanced manufacturing at Lakes Region Community College and to nursing at NHTI. Others applied to four-year degrees in history at Plymouth State University, aviation at Southern New Hampshire University, computer science at the University of New Hampshire, engineering at the U.S. Coast Guard Academy, as well as a host of other programs of study both in and out of state. Many are the first in their family to consider post-secondary education and others come from highly educated families but have simply been spinning their wheels. One lucky young person who attends the day’s program will earn a $500 scholarship, just like students from each of the 34 participating high schools across the state. It is expected that between Nov. 13 and Dec. 1, more than 1,300 New Hampshire seniors will have submitted more than 2,800 applications to colleges (80 percent of which are in-state), likely saving more than $100,000 in application fees. While these numbers are encouraging, what strikes me most is the power of individual connection. A student might aspire to earning a college degree, or not, but either way the reality of applying and attending seems distant from their current circumstances. As the student I am helping revises his essay, I listen to the table next to me where an admission counselor from Southern New Hampshire University is sitting with a student applying to St. Anselm College. I am reminded that all it takes is one concerned adult by a student’s side offering support. Public high school teachers and counselors are clearly out numbered with dwindling school budgets and large class sizes, but why must this responsibility be left to them? Imagine if each adult who reads this piece committed to mentoring one or two high school students. Better yet, consider the outcome if each reader identified a student earlier in middle school to encourage toward post-secondary education or credentialing, following that individual with reinforcement and inspiration for the next six years. Whether it is a neighborhood kid, a young person you connect with through the Friends Program or the teenager bagging your groceries, ask the question about what lies ahead after high school and offer support in making it a reality.